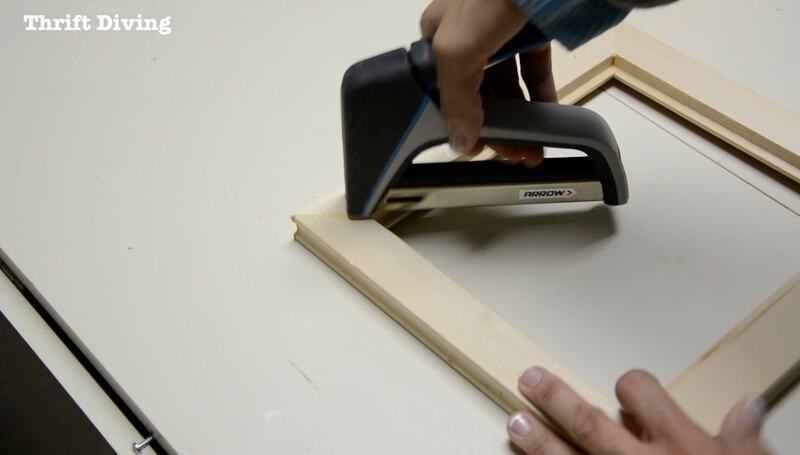 As much as I love power tools, I do realize that not everyone who reads this blog has them, which is why I wanted to put together a tutorial on how to make picture frames with a miter box instead. 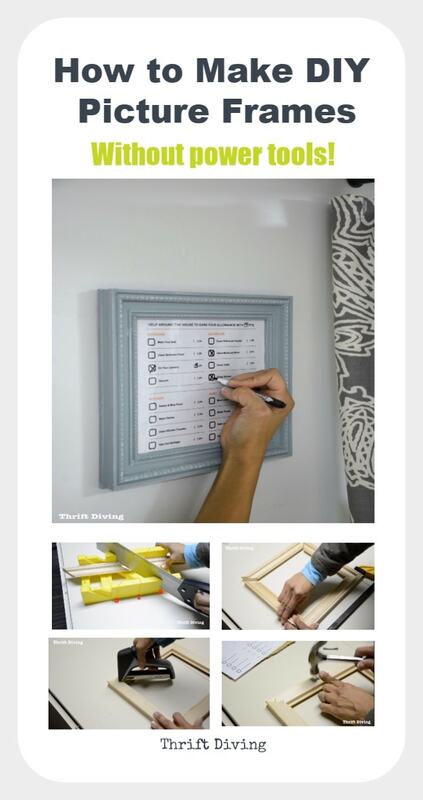 And what’s awesome is that you can literally frame anything or any size just by cutting it to the length you need. Now we can easily frame anything (pictures, bathroom mirrors, printables–you name it) with our own picture frames, no matter how big or small! 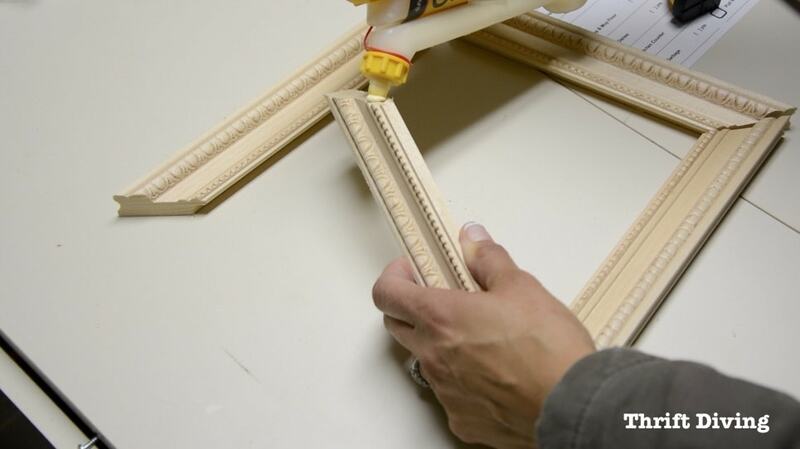 Picture Frame Molding is GENIUS! But since I have always bought frames from the thrift store and have never tried to make my own DIY picture frames, I had no idea it even existed! 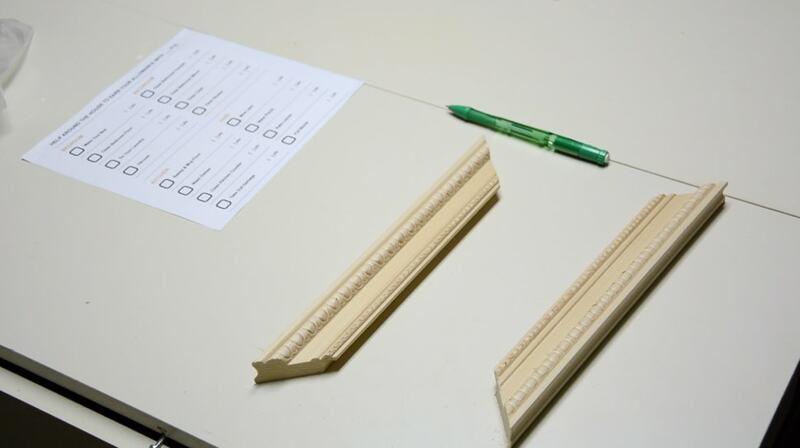 Typically, when making your own picture frames, you need a router (or a table saw) to create this groove called a rabbet (sounds like “rabbit”). 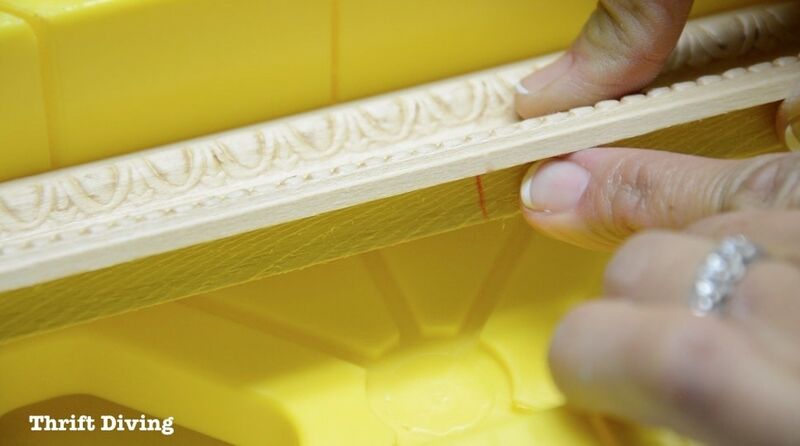 But picture frame molding already comes routed with a rabbet cut (in various depths), so all you have to do is cut the molding at 45-degree angles and–VOILA!–you’ve got a picture frame. If you check Amazon, there are a bunch of options for picture frame molding. Your local home improvement store likely only has a simple wood one like the one I’m using in this project. Anyhow, instead of using a powerful compound miter saw power tool to cut the 45-degree angles, we’ll be using a hand-held miter box to do it. 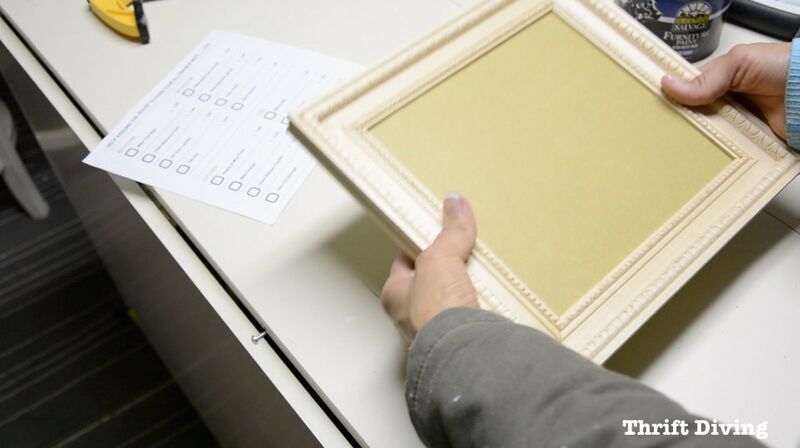 Here are the simple steps for making your own picture frames. 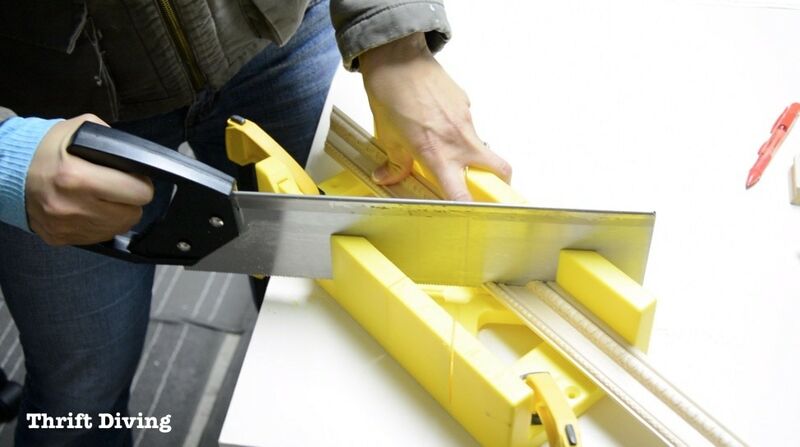 Even if you’ve got power tools, you’ll want to add a miter box to your DIY toolkit. For about $10 or less (check this one out on Amazon), you can easily cut thin pieces of wood and molding without having to use power tools. Of course, a compound miter saw is much easier, but not everyone has a big ‘ole power tool accessible to them, right? Or even the space to house it. A miter box can easily be tucked away, though. 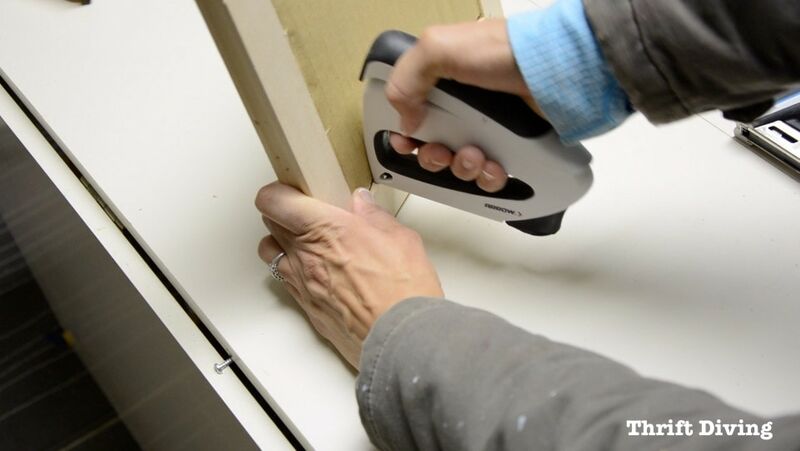 Plus, sometimes it’s easier to use a miter box for a quick and easy little cut. Before you begin cutting, though, tightly clamp the miter box to a tabletop that’s sturdy–maybe a dining room table, a sturdy workstation, etc. Be sure the clamps don’t get in the way of the wood, though. Place the picture frame molding against the miter box. Position #1 – Cut the wood at a straight 90-degree. Position #2 – Cut the wood at 45-degrees THIS way…. Position #3 – Cut the wood at 45-degrees THAT way…. The first cut is usually at 45 degrees (as shown on the left side of the wood below). 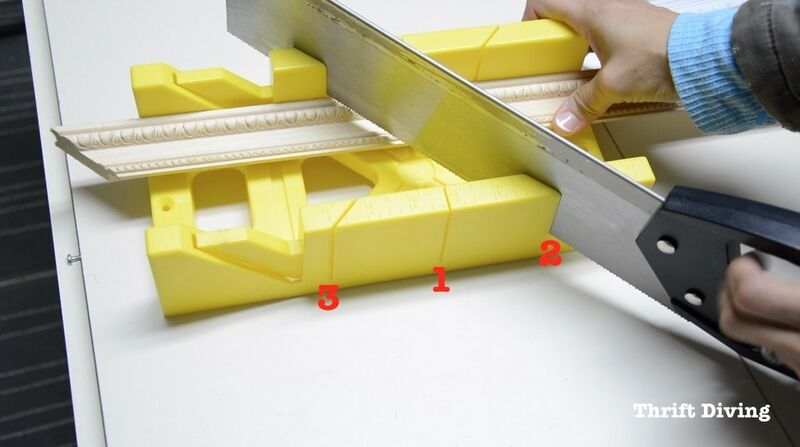 With this cut, we’ll be able to measure how wide we need to make the DIY picture frames. 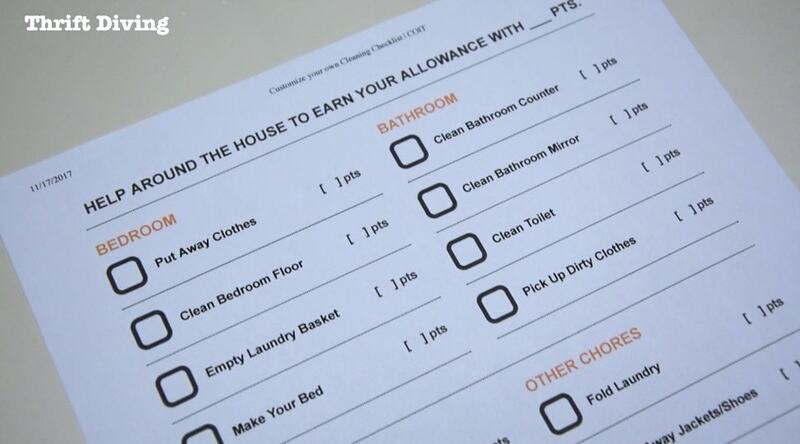 For this project, I planned to frame a cleaning checklist for my kids to use to earn points towards an allowance. 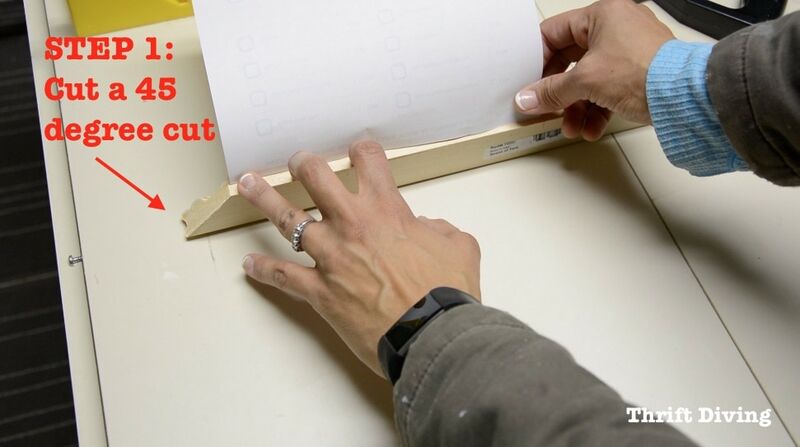 (TIP: One viewer on Youtube had a great suggestion to laminate the cleaning checklist so that I can reuse it over and over again without having to print new ones or without removing it from the frame. Love that idea!). After I printed out the checklist and trimmed it to the size I wanted, I simply placed it on the picture frame, lining up the left side, and then marking the width on the right side. 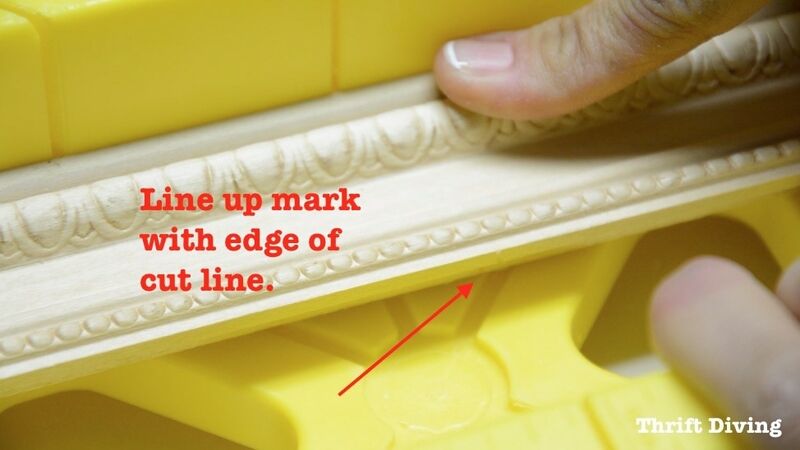 When cutting the right side of the picture frame molding with the miter box, line up this marked line…..
….with the edge of where the blade will cut. At that point, I was then ready to cut the other 45-degree angle. This was the top piece of the picture frame. 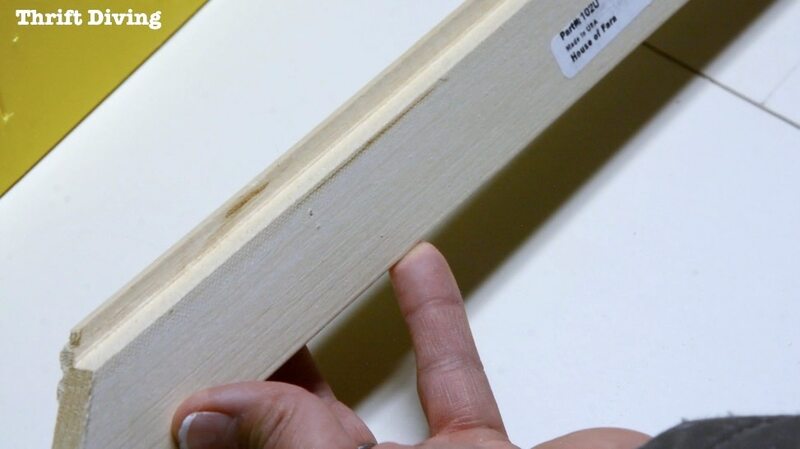 NOTE: Since the picture frame molding can be a bit long, be sure to have someone support the longer side if you don’t have a long table to support it. Otherwise, it may chip off like mine did when I sawed through it. Since my picture cleaning checklist was a bit rectangular, the top and bottom were the same, and I re-measured to make the sides. At this point, you should have all the pieces of the picture frame cut out. If you’re cutting something square, all 4 pieces will be the same length. You’re now ready to glue them together and then clamp them to dry. 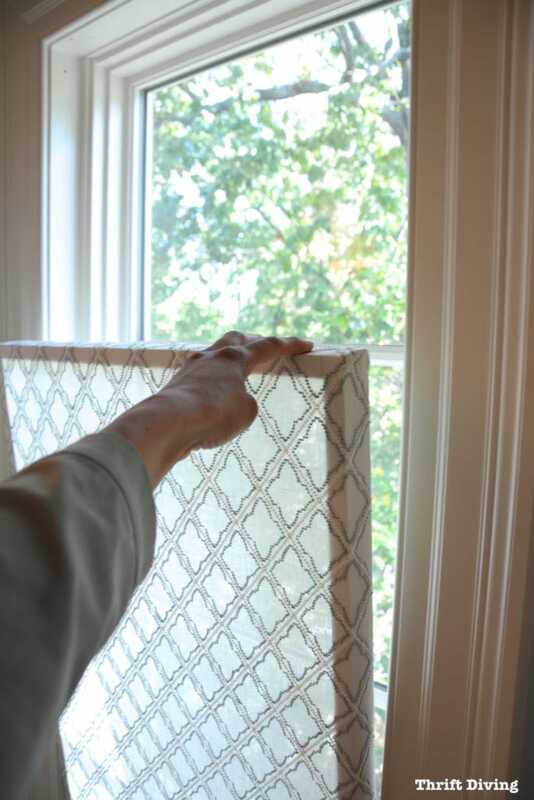 You can use the miter saw to also make a privacy window screen, because the idea is the same: cut four pieces of wood using a miter box to create a frame. Only this window screen has a layer of fabric glued over the wooden frame. Very simple! I don’t know about you, but I get so many packages in the mail that it shouldn’t be a problem to find a spare box lying around from which to cut a piece of backing for your DIY picture frame! Using the checklist, I traced its shape, then cut it out with a utility knife. Once the picture frame has had time to dry, remove the clamps and turn it over. 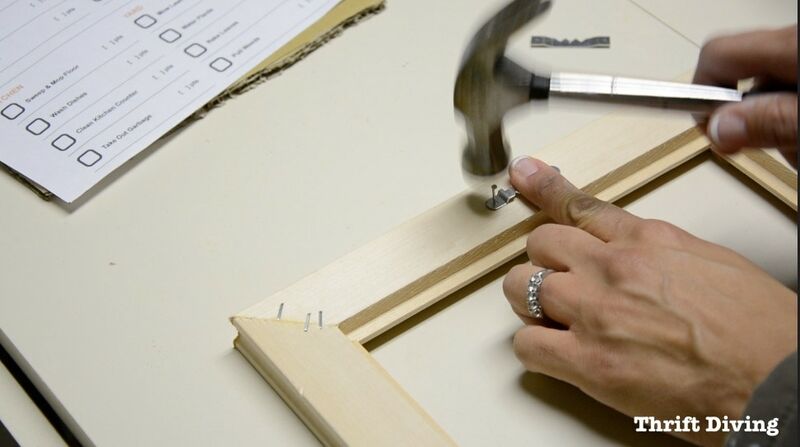 Use a stapler (I’m using this heavy duty stapler) to staple the frame together at the corners for extra reinforcement. I like the sawtooth picture hangers (they’re less expensive) because they’re very forgiving, even if you don’t center them exactly. They’re super easy to attach with a hammer on the back. Using 150-grit sandpaper, sand the custom picture frame, paying particular attention to the corners where it can be a little sharp. For this project, I didn’t get glass cut, but you can easily head to a local hardware store (check your local listings for who offers this service; not every home improvement store does). I’m did end up laminating my checklist so that I can reuse it over and over without having to remove the back. 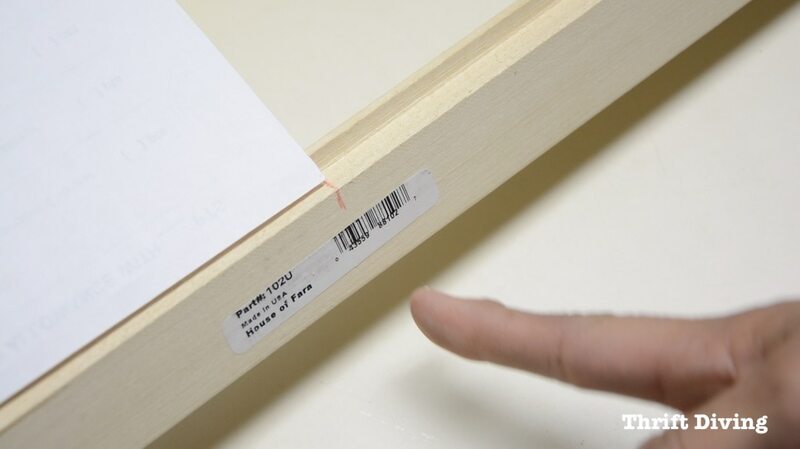 To secure the back, I used a light-duty stapler to staple into the edge of the wood in the back, which was enough to hold the cardboard and checklist inside. The Final DIY Picture Frame! I couldn’t believe it was so easy to make! All those pieces of artwork that hubby has stashed in the closet can now be framed. I’m not a professional framer so who knows if I’ll stretch it properly, but this would be a pretty good DIY solution for framing! You can leave it natural or paint it. (Psst! 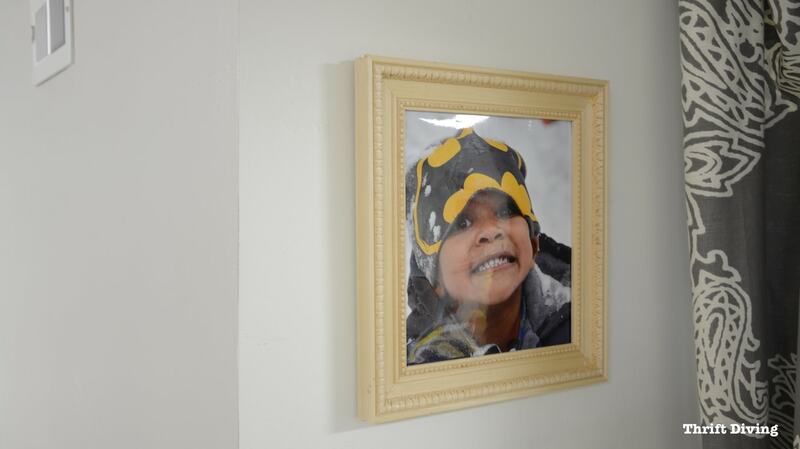 Check out my post on 10 tips to create aewsome DIY wall art for your picture frames). (I used a layer of white on the frame, covered with a second coat of light blue, then lightly distressed the DIY picture frame). You can frame pretty much anything, including favorite pictures! Is It Cheaper to Make Your Own Frames? If have odd-shaped items that you’d like to frame, that would be too expensive to pay for custom-sized frames. If you have a builder’s grade bathroom mirror that you’d like to frame around it. Very easy to do! Picture frame molding can be expensive. The piece I bought was $12 and I had enough for this frame with a little left over for a smaller frame. A bit pricey, yes. If you have common-shaped items (e.g. 4×6, 5×7, 8×10), then by all means, go buy picture frames from the thrift store. It’s cheaper to do that. Did you enjoy this tutorial? Then be sure to SAVE it on Pinterest! 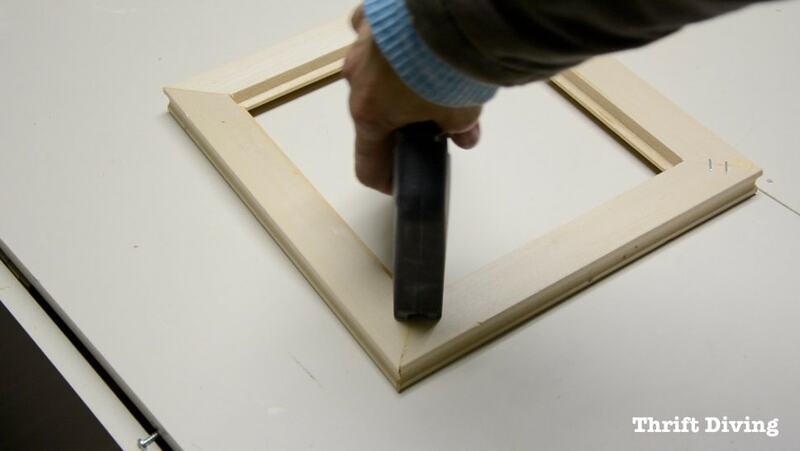 Have you ever made your own DIY picture frames? How did they turn out? 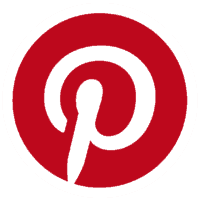 Be sure to check out my Project Gallery for more DIY projects! Thank you for this great tutorial, complete with photos! I have several 8×8 paintings and finding inexpensive 10×10 or 12×12 frames for them is proving to be a futile search. I have a manual mitre saw, which I’ve become fairly accomplished at after helping hubby finish my she-shed art studio, so now I can’t wait to put my skills to use on some frames! Also love your idea of stapling around the edges to hold the backing on. Since I’ll be framing pieces to sell, I’ll probably use Masonite on the backs. I still think I can save a significant amount of money! 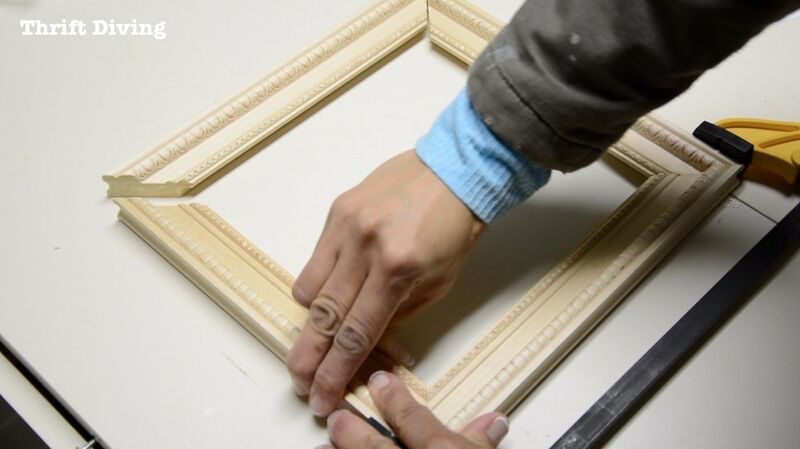 This DIY frame is the best since it has a step by step instruction and images on how to do things…I’m sure it will go smooth just by following it.. 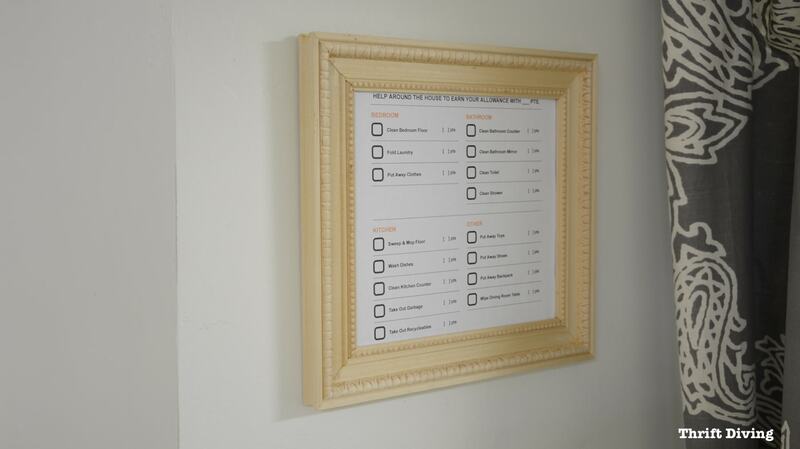 I didn’t exactly make a frame, but I made something I could use to hold and hang some unframed paintings on cardboard. I took apart wire coat hangers from the dry cleaner and bent them to make corners with tabs that folded over to hold the corners of the cardboards. Then I connected the corners in the back with florist’s wire. Sort of like wire plate hangers. I hung them from the center of the florist’s wire. The folded wire tabs show just a bit where they bracket the corners of the cardboard. As the paintings are folk art, the wire coat hanger brackets worked very well with the feeling of the art. I must say I was quite pleased with how they turned out. …and what a pretty shade of blue! Serena, I bought a mitre box a couple of weeks ago at Harbor Freight for under ten dollars. I like the idea of being to make a frame in any size. Thank you for the tutorial. Perfect! Sounds like you’re ready to go, Ana! 🙂 You’ll find that it’s SUPER easy! Great timing. I need a long skinny frame. I thought I’d have to buy a frame and deconstruct it to make a new one. Your instructions make it look easy. I also like the paint colors you picked. Happy Thanksgiving . Woohoo, glad I was able to help! 🙂 Happy Thanksgiving to you, Kathy!! Love this! The first time I tried making a frame, I forgot to reverse the angle for the second cut and ended up wasting a fair amount of moulding. Live and learn, right?!? 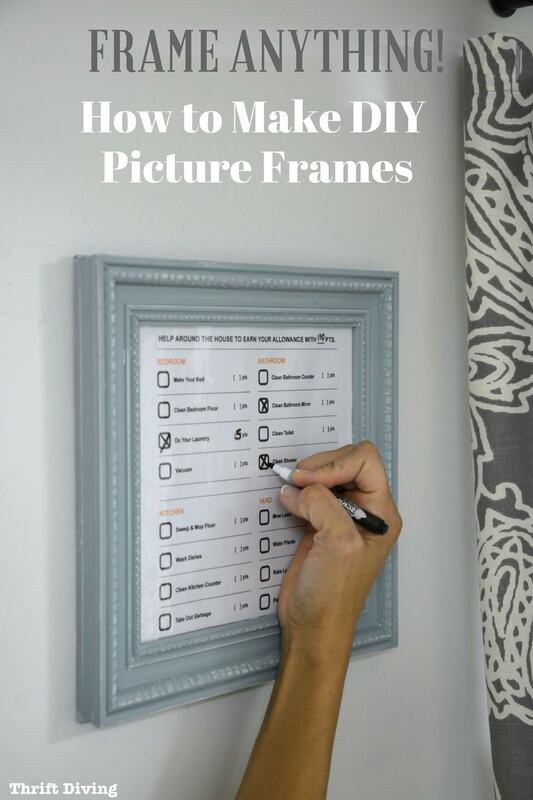 Another way to reuse the checklist would be to use glass in the frame and then use a white board marker to check things off. The marker wipes right off the glass. 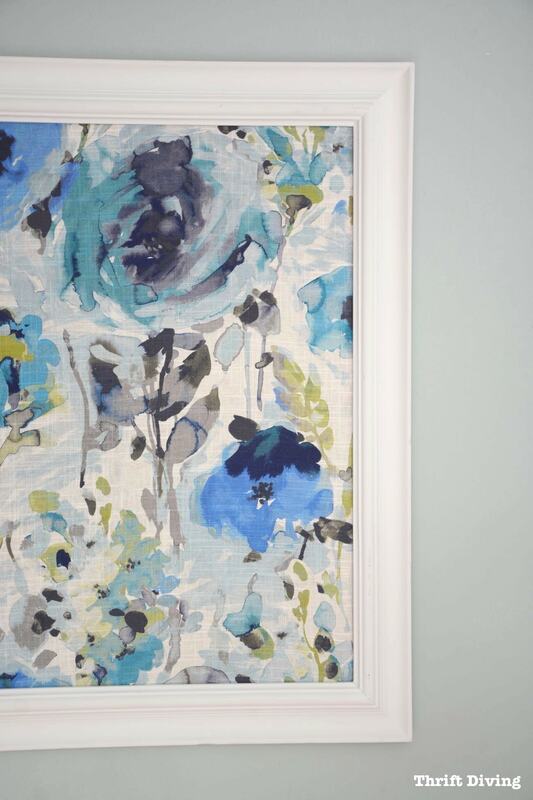 Framing pretty paper or fabric this way is an easy way to make a memo board which coordinates with your decor. LOL, Nita, it’s easy to get the angles messed up, for sure! 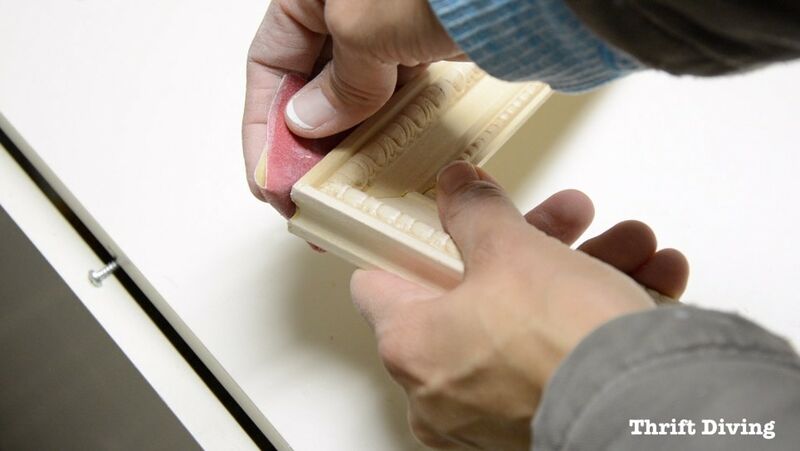 The same is try when doing crown molding. That’s similar to a picture frame, too, especially around corners and stuff. 🙂 You’re right–using a frame with glass is a great idea for being able to wipe it off. And yes on the memo board! 🙂 Happy Thanksgiving to you!